TD objects to EC move to bar EVM expert from delegation. Vijayawada: The Telugu Desam has objected to the Election Commission not allowing technical expert Hari Prasad Vemuru to attend its meeting to be held on Monday to discuss the malfunctioning of EVMs. 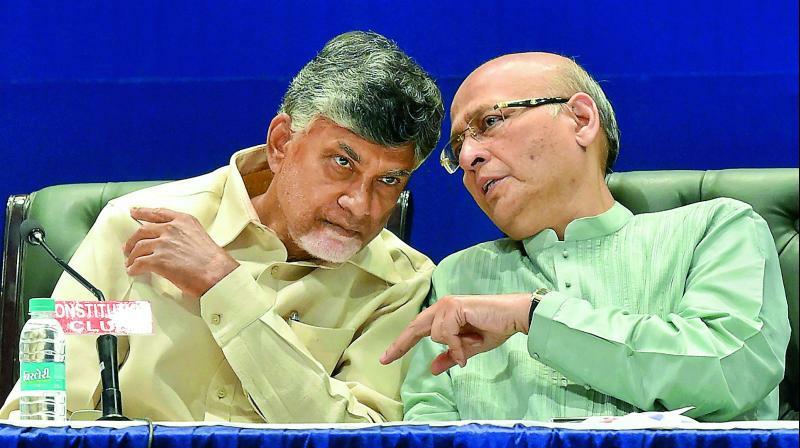 The TD stated in a letter to the ECI that Mr Hari Prasad was technology adviser to AP Chief Minister N. Chandrababu Naidu and so the ECI should allow him to explain about the EVMs malfunctioning during the April 11 elections as a technical expert. The party claimed that the ECI had earlier taken suggestions from Mr Hari Prasad with regard to developing VVPATs. Telugu Desam MP Kanakamedala Ravindra Kumar stated that the party had lodged complaints and written letters to the ECI regarding the EVMs and this was the first time they had got a reply. He said that the TD objected to the ECI saying that Mr Hari Prasad was involved in a criminal case regarding alleged theft of an EVM in 2010, in which an FIR was filed (Crime No.159, May 13, 2010) at MRA Marg police station, Mumbai. He said that no chargesheet has been filed in the above crime even after nine years. Mr Ravindra Kumar said that Mr Hari Prasad is the first Indian to be honoured with the EFF Pioneer Award 2010 by the Electronic Frontier Foundation (US). As a security researcher in India, he had revealed security flaws in India’s paperless electronic voting machines (EVM). Further, he has published a research paper on the vulnerability of Indian EVMs along with internationally reputed co-authors from the US and the Netherlands. Mr Ravindra Kumar said Mr Hari Prasad’s efforts were recognised and his suggestions received positively by both former chief election commissioners Dr S.Y. Qureshi and V.S. Sampath, which led to the designing of the VVPAT, which creates a paper trail of the votes cast. Mr Prasad was also invited by the Election Commission on July 16, 2011, to participate in the first field trial of VVPAT where he met the Mr Sampath and deputy election commissioner Alok Shukla. The ECI had duly noted the suggestions given by Mr Hari Prasad. Mr Harish Prasad and his team have attended several other ECI meetings related to EVMs, and all those events were after the case slapped against the whistle-blower in August 2010. Mr Ravindra Kumar said that Mr Hari Prasad had attended Saturday’s meeting with the Election Commission as part of the CM’s delegation in the capacity of technology adviser to Mr Naidu, and demonstrated the discrepancy in the VVPAT machines before CEC and his team. After his presentation, the CEC invited Mr Prasad at 4 pm to meet Mr D.T. Sahani, chairman of the technical expert committee of the ECI, to discuss the matter. He was accompanied by TD MP K. Rammohan Naidu. He was then informed that the ECI was not willing to discuss anything with Mr Hari Prasad because of the criminal case, though he has been invited to, and attended sessions on, EVMs in the same premises before the commission on earlier occasions. Mr Ravindra Kumar sought the ECI to allow Mr Hari Prasad to meet Mr Sudeep Jain and Prof. Sahani on Monday.